One person died and 8,469 people were affected in torrential rains that prevails in Galle from Saturday evening, Galle Additional District Secretary M.M.M Sharfaz said. Over 8,469 people in Baddegama, Yakkalmulla, Imaduwa, Thawalama, Niyagama, Nagoda, Habaraduwa and Akmeemana were adversely affected, he said. The Galle Disaster Management Center Head said the deceased was identified as a father of four (60), a resident of Urala in Wanduramba. He had drowned in flood and his body was found yesterday evening, he said. He said five houses were completely destructed, and 244 were partly damaged. Several highways including the Galle-Udugama, Ahangama-Makumbura and Galle-Yakkalamulla roads were inundated. The Galle DMC said rescue groups were on alert and 23 boats and nine canoes were dispatched to the flooded areas. The Galle Irrigation Department said Giganga water was rising and the people of low lying areas should be vigilant. Divisional Secretaries had provided the affected with food items and drinking water. 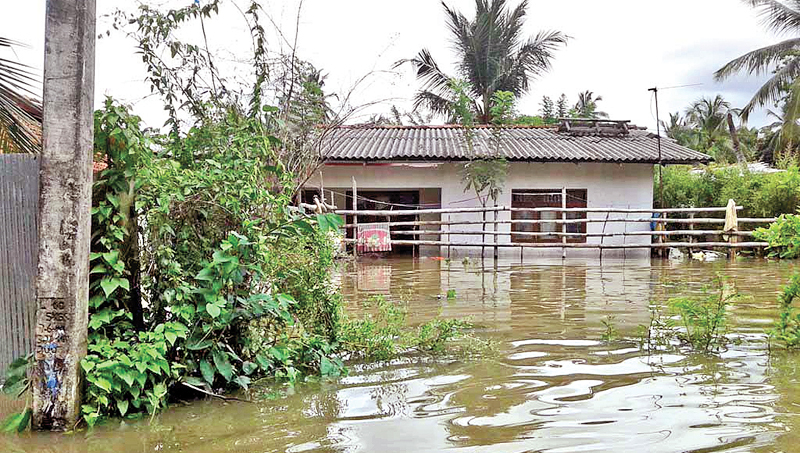 The Additional District Secretary said Navy, Army personnel and voluntary organisations will be ready provide their service at any time.The Department of Meteorology said the highest rainfall (334 ml) was reported from Poddiwala in Elpitiya Divisional Secretariat, while a rainfall of 195 ml, 277 ml and 122 ml were reported from Hiniduma, Badegama and Galle.